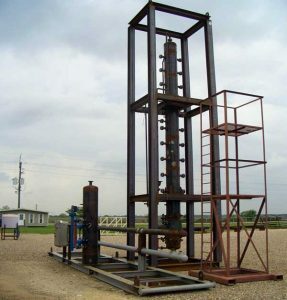 Stabilization of natural gas liquids (NGLs) or field condensate is a process utilizing controlled flashing and, in some cases, a distillation of the liquid to allow it to be stored in atmospheric vessels. The distillation of the liquid can also be used to remove objectionable non-hydrocarbon components, most notably CO2, from the sales liquid. 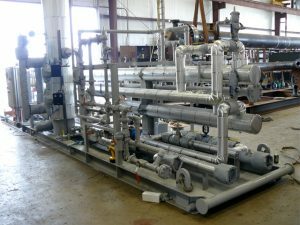 The DPC NGL stabilizer process uses tried-and-true conventional technology, employing the same modular fabrication techniques DPC uses for its standard gas conditioning equipment, allowing for high levels of quality control. 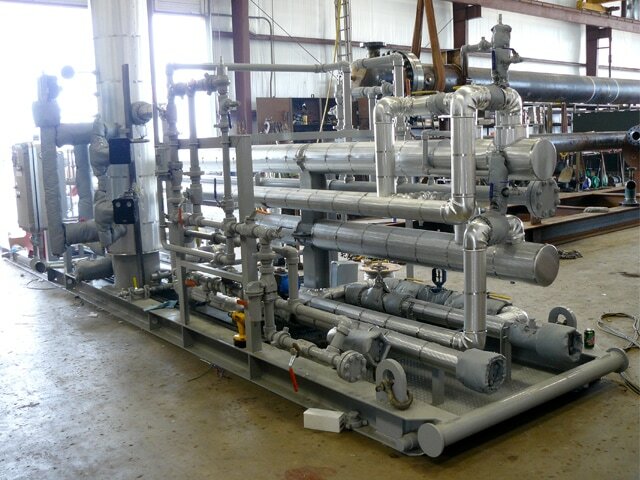 All of the equipment and piping is designed, fabricated and tested per ASME and TEMA codes and standards. The system is all electric, minimizing permitting issues and reducing the hazards associated with direct-fired equipment in an oil field production environment. 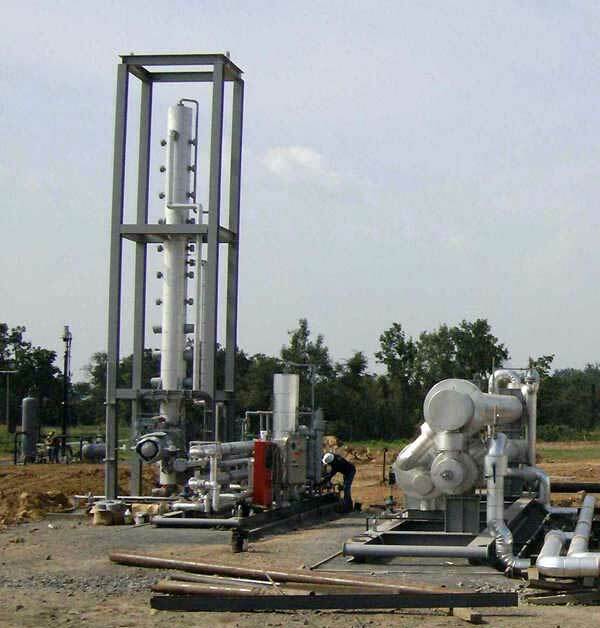 The equipment used in the DPC stabilizer process simply provides a way to “cook” the volatile hydrocarbons liquid mix, at the optimum pressure (50 to 350 psig) and the required temperature levels (100 °F to 400 °F). 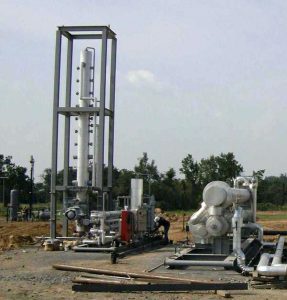 This is done in a distillation tower, controlled in such a way as to drive off the light gaseous hydrocarbons and other gaseous contaminants to be used as a fuel stream or recycled through the conditioning equipment, eventually to be sold as part of the pipeline quality natural gas. The resulting “stabilized” liquid thereby has a much-reduced volatility. In many cases, the liquid can be stabilized to a point that it can be stored and transported in non-pressurized vessels (crude tankers,) both enhancing safety in handling, and improving the liquid’s marketability. This liquid can be marketed as a crude or “dead” condensate. In other instances, our clients may want to limit the amount of vapor is driven off from the liquid, and sell a “moderately” pressurized product to an available market. Meeting a MAPCO “Y-Grade” NGL pipeline specification is a typical application. This choice only requires an adjustment in operating temperature and pressure of the stabilization unit. DPC has designed a standard unit to stabilize a nominal 500 BPD of NGL production to 9# Reid vapor pressure (RVP), with an easily operated system in a very energy efficient manner. The heat source is an electric resistance process type immersion heater, procured along with its control system, from an “old-line” process heater manufacturer. The electric heat allows for a simple installation and a stable and safe operation and avoids producing any air emissions associated with the direct-fired equipment. The maximum allowable operating design pressure (up to 1000 psig) and temperature ratings (650 °F) of the system components are far in excess of the anticipated operating conditions. In other words, the equipment is overdesigned and understressed in operation. This is deliberately done for enhanced safety and durability. The stabilizer is a top feed quench, center heated feed tower design. 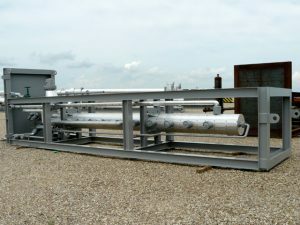 Bubble cap trays are used to give the tower a stable operation over a wide range of flow conditions. The stabilizer tower has both top and middle tray liquid feed points. 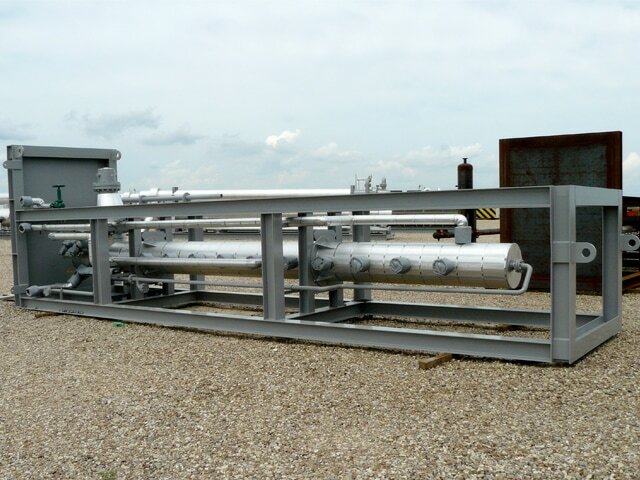 Multiple heat exchangers are used to recover the heat from the stabilized hot bottom product and return the energy to the middle feed tray for maximum energy conservation and product cooling. The stabilizer system is built on two process skids. 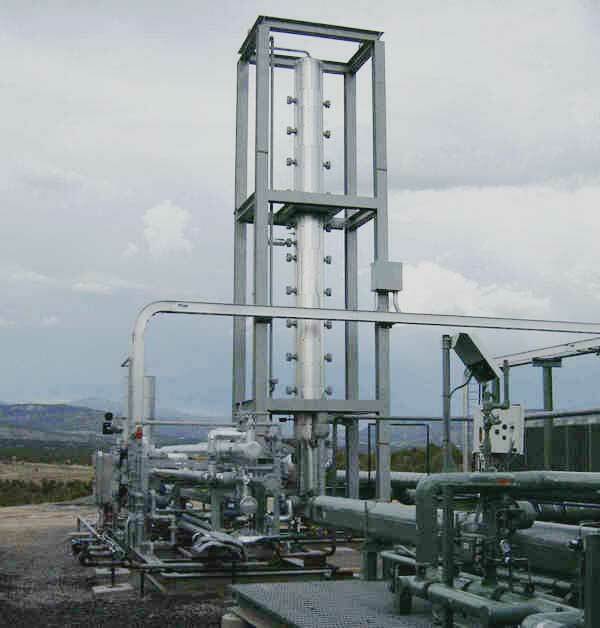 The tower is mounted on a stand-up skid that then bolts to the heat exchanger and control skid for a quick and simple installation. The skids are designed to be set on stabilized ground. Concrete foundations are not typically required.